Daylilies enamour me. Their shapes, size, color, and even their infrequent smell. The way they feel in my hands, the smiling new flower faces each morning, and the faithful green foliage playing at the feet of a beautiful scape. I love it all. I love pinks, yellows, reds, purples, those crazy near-whites. I love the eyes, the throats, the rounded, the recurved, the polys, pinched, exotics, doubles, spiders, dips, and tets. I even love the perpetual “ditch lily” that might have started it all. In fact, that one may be my favorite. Having spent most of my summer sun-kissed days at my Grandma’s and Great Aunts, I can remember being amazed at the tall leggy flowers that always bloomed in time for a 4th of July display. “My own Fireworks”, I thought, and as a curious little kid, my grandma forever hollered at me for bending the tall flowers down so I could see their “faces”. The center of that flower seemed to go on forever in my young eyes, swirling from orange to yellow. My tiny nose always dusted with pollen as I pushed in for a smell I never found. At that time of my life, some 25 years ago, I never noticed the circle of life that surrounded these plants; I just remember them always being there. After my Great Aunt passed away, I inherited her home, and inadvertently, those very flowers that gave me smiles as a young girl. 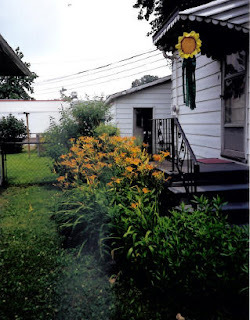 In October of 1995, I moved into the house and spent the winter remodeling the interior of this 60-year-old house, not paying much attention to the yard and space surrounding the house. As the winter gave way to an early Spring, and the backyard grass peeked out from under the cover of the melting winter snow, I realized this little piece of green winking at me was mine to take care of, add to and share with others. And then the most amazing thing happened. I was literally knocked a step back as I was taking a walk in the garden soon after it got a bit warmer. There they were. The fireworks I remembered. But they weren’t fireworks yet. They were little tiny green turtle heads sticking up out of the wintery soil. Hundreds of them, seemed like thousands! (I gasped out loud, and then looked over my shoulder to see if anyone heard me.) I had forgotten about my summer friends, what with high school and college and a new career and all. I watched them during that early spring, spurt an inch or two closer to the sky each day. I watched them put up their scapes, as a military color guard would raise their banner poles. And later that month, I watched the “fireworks”, and cried. Tears of joy and remembrance of summers past. I grabbed a scape with all five of the same fingers that grabbed it as a child, and I stuck my nose in it as far as I could. And somewhere off in the wind and heaven, I heard my Grandma holler as I pulled away with pollen on my nose. As I’ve spent a little more time in the daylily world, and with gardening in general, I haven’t become any more disenchanted, only more enthralled. I hear stories of these “ditch lilies”, Hemerocallis Fulva if you prefer, surviving for tens of years with no care at all along roadsides and dotting century old farm homesteads. I see them there, standing alone, and think of the fingers that used to grab those scapes to get a better look. Conversations had near those now abandoned flowerbeds echo in the whir of the wind and stir my soul. You could give me all of the top-of-the-line, exotic, blue, white, one-of-a-kind-$500-a -piece daylily cultivars that you could find, but I wouldn’t trade my classic “ditch lilies” for them all. You can’t copy or improve the feeling of pure joy. I am content to be a witness to this wonder we call gardening, and share the joy with as many others as I can. beautiful. you make it all sounds so exciting. How lovely to inherit day lilies in this manner and to carry on the tradition of growing and advocating for them. I can feel your love for the lilies, the garden and grandma. Good post too. You need a different square to check. For me, it was a story I could relate to though nothing exactly like this happened to me. It was an enjoyable piece to read where I could see the love for your grandmother being transferred to the daylilies growing in her yard. I have plants and trees in my yard that are from my grandmother, my uncle, a relative of my wife who died of cancer, and I know how their spirit seems to live on in these plants. The box you should add is "Love it!" My daylily foilage is really growing here in the south. I can't wait to see what blooms open on these scapes. Other surprises this year include iris from last year's garden show and the gladioli - plants that grew in hard-packed soil between side walk cracks, now they grow and bloom like Jack-in-the-Beanstalk plants. Like you said, these orphaned, neglected plants that produce beautiful yellow, orange blooms all up and down their tall stalks survive, thrive, and give much more pleasure than $$$$ plants from the fancy floral shop!